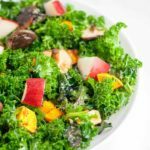 This Paleo (and vegan) Roasted Butternut Squash and Shiitake Mushroom salad brings new life to your run-of-the-mill kale salads. Two thumbs up for this Butternut Squash with Shiitake Salad! 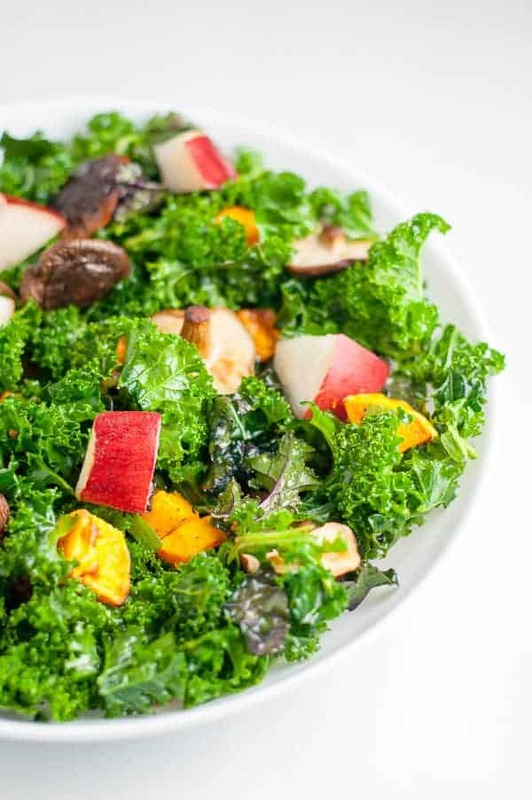 Here’s a wonderful fall or winter salad that tastes far more interesting than it sounds. 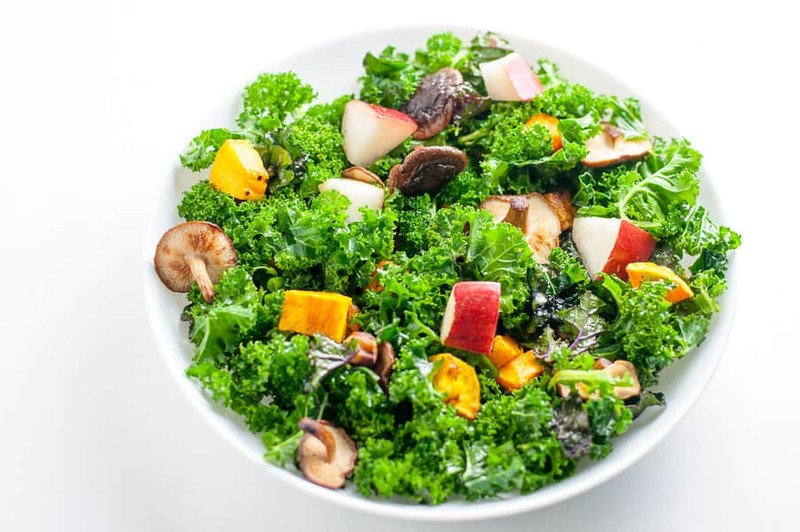 Full of healthy kale, crispy butternut squash cubes, warm shiitake mushrooms and crunchy pears, it’s topped with toasted hazelnuts and tossed in an ever-so-slightly-sweet dressing. And there’s one secret ingredient that makes all the difference! Secret ingredient? Smoked salt. 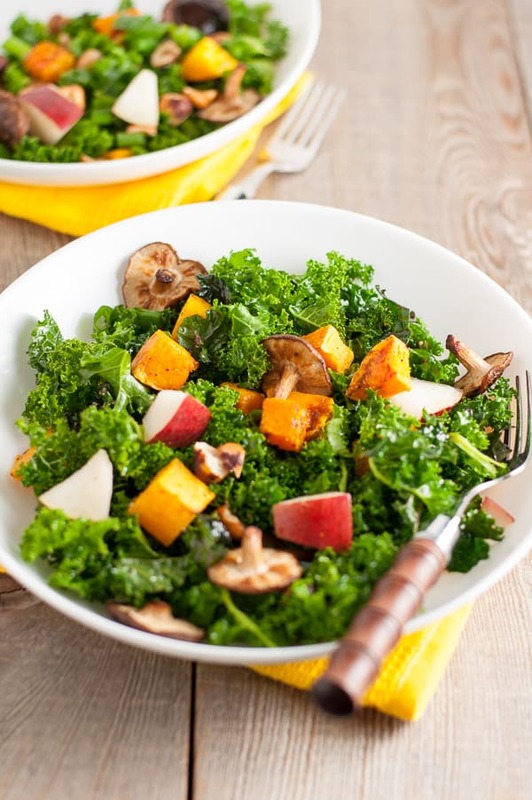 This Roasted Butternut Squash and Shiitake salad is pretty too, don’t you think? Its warm, earthy colours made a perfect accompaniment to our pistachio-crusted salmon dinner. I gathered some kale from my garden that survived our first frosty week, a butternut squash, some organic Shiitake mushrooms, a red Anjou pear, some green onions and a handful of hazelnuts and had fun putting it all together. Best part: it got lots of luv at dinner time. Definitely one to make again! 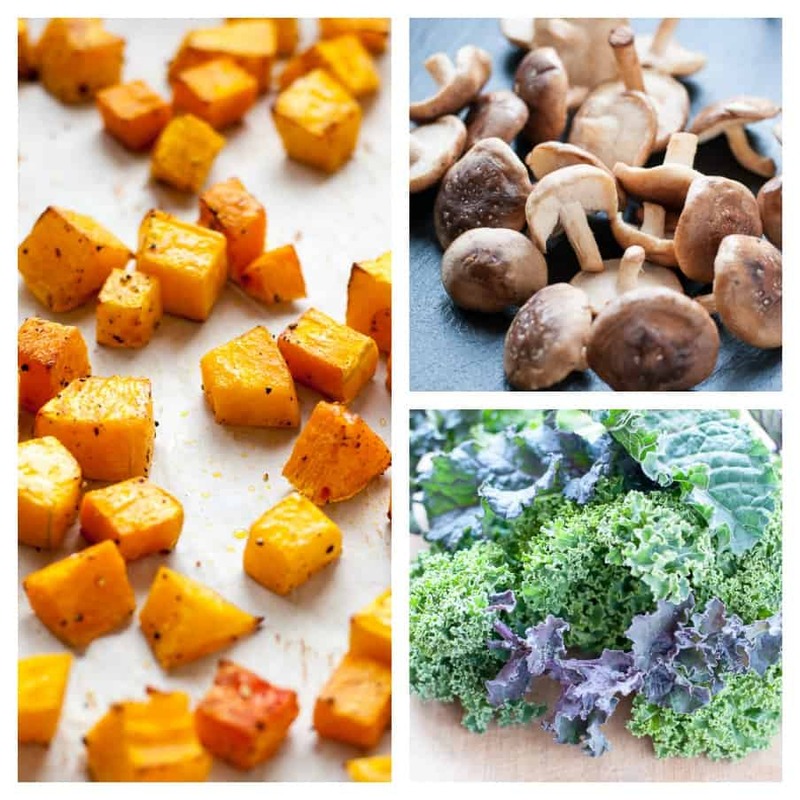 Warm roasted cubes of butternut squash and shiitake mushrooms with crisp pears and toasted hazelnuts or pumpkin seeds combine to make a two-thumbs Butternut Squash and Shiitake Salad. Heat oven to 400°F. Heat a rimless baking sheet in the oven for 4-5 minutes. Toss the diced butternut squash cubes with olive oil and salt and pepper. Spread out on hot baking sheet and roast for 20 minutes or until crisp on the outside and tender. Meanwhile toss trimmed shiitake mushrooms with tamari or coconut aminos, place on a baking sheet and roast for 10 minutes. Wash and dry kale, remove tough center ribs and chop or tear into small pieces. Massage with 2 teaspoons of olive oil in a large bowl. Add the green onions, pear, warm butternut squash and shiitake mushrooms. Whisk the dressing ingredients together and toss the salad. Sprinkle with chopped hazelnuts or spiced pumpkin seeds and serve immediately.